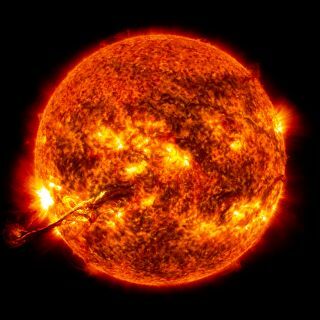 NASA spacecraft watching the sun have captured jaw-dropping pictures and video of a giant filament of super-hot plasma reaching up from the star's surface and erupting into space. The filament was made of solar material that was ejected from the sun during an intense solar storm on Aug. 31. Flares are caused by increased magnetic activity on the surface of our star, and are becoming more common as the sun approaches a phase of peak activity in 2013. This image shows a close-up of the huge solar prominence of Aug. 31, 2012, is clear in this full-disk image of the sun by NASA's Solar Dynamics Observatory in the 304 and 171 angstrom wavelengths. The filament was spotted by NASA's Solar Dynamics Observatory, was likely gigantic, scientists say. The spacecraft and other sun-watching observatories recorded an amazing video of the giant solar filament and the solar eruption, called a coronal mass ejection (or CME), that followed. The filament erupted out into space on Aug. 31 at 4:36 p.m. EDT, releasing a coronal mass ejection that traveled at more than 900 miles (1,450 km) per second. Coronal mass ejections are made of charged particles, and when they collide with Earth, they can disrupt satellite and radio communications and damage power grids. A more benevolent effect of CMEs is that auroras, also known as the Northern and Southern Lights, can put on especially beautiful shows as these charged particles hit Earth's magnetic field. Indeed, some skywatchers on Earth managed to catch views of these auroras in the days after the Aug. 31 solar storm. "The CME did not travel directly toward Earth, but did connect with Earth's magnetic environment, or magnetosphere, with a glancing blow, causing aurora to appear on the night of Monday, September 3," NASA scientists wrote in a statement. The filament itself was photographed by the Solar Dynamics Observatory in four different wavelengths of light, corresponding to solar material at different temperatures. By comparing these images, scientists aim to better map out how this solar plasma moves during an eruption. Solar filaments are also known as solar prominences (they are filaments when we can see them against the face of the sun). They are anchored to the sun's lower atmosphere layer called the photosphere, and extend outward through its shot outer atmosphere, called the corona.